In light of recent terror attacks across the world, being able to provide first aid and an improvised tourniquet has become essential. The trauma and devastation caused by explosions can be horrific and in the aftermath of such an attack being able to apply an improvised tourniquet could save someones life. One of the most common questions I get when teaching is “Are you going to show us how to make a tourniquet?” I’m not sure if this stems from watching old westerns with cowboys twisting handkerchiefs around a stick, but apparently this is something that people know to ask about, but not how to do properly. This post is designed to teach you how to fashion an effective improvised tourniquet. But before we begin, it’s absolutely essential that we start with one caveat. Improvised / makeshift tourniquets should be converted to a commercial tourniquet as soon as possible. OK it’s a blog post on improvising a Tourniquet but I wanted to stress how much more successful the outcome can be if you have the right tool for the job. Material should be at least one and a half inches in width, but no one is going to take time to measure. Utilizing material thinner then one and a half inches is less likely to stop arterial blood flow and more likely to cause nerve damage. Tourniquets that are not wide enough are more dangerous and less likely to be effective. Remember, your largest artery is approximately the thickness of your thumb, so compressing/standing on/kneeling on that limb is a far better option then bleeding out. Belt – seems to be the number one thing people suggest using, however it’s a poor choice for an improvised tourniquet. Under stress people will try to tighten a belt around a limb the same way it’s tightened around a waist and that will never be tight enough to stop arterial flow. Option two is to use an object as a windlass to gain a mechanical advantage. A windlass is a crucial step in fashioning an improvised tourniquet but is unable to to create enough torque or pressure due to the belts rigidity. Carabiner – these make a great windlass provided they are sturdy enough. Stick – a good old fashioned stick, sturdy enough to not break with pressure. Jack handle – trauma is often the result of a motor vehicle crash and most vehicles are equipped with a jack. Broom handle – may need to be cut down but should be sturdy enough. Hands – trying to rely on your hands and brute strength is a bad idea and likely to result in an ineffective tourniquet. Adding a windlass to an improvised tourniquet is a crucial step in the process and should not be skipped. Studies show a 32% failure rate with use of a windlass compared to a 99% failure rate when no windlass is used. 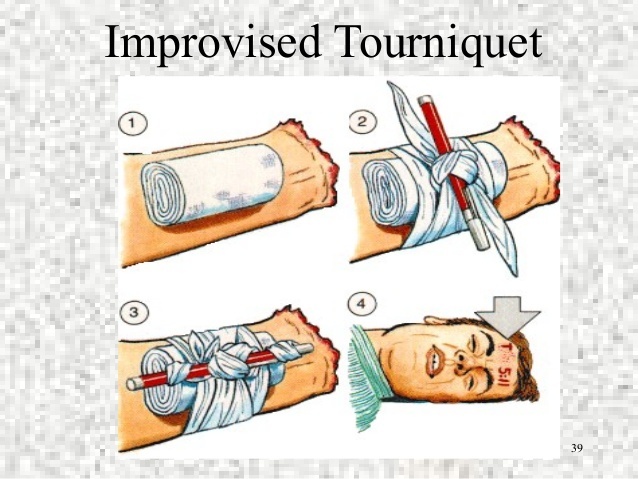 The picture shows an improvised tourniquet using a pair of tough cut scissors. 4th Step – Once the tourniquet is complete the next step is to reassess the wound and confirm that the bleeding has stopped or slowed down to an inconsequential amount. *Bonus Tip – if possible check for a pulse in the injured limb, a pulse should not be present below the tourniquet.